When I found this vintage skirt at Goodwill a few years ago, I didn’t think I’d wear it as much as I do, but it’s now one of my favorites. (It was longer when I first found it, but I had it hemmed to just above the knee.) Lately I’ve been wearing it like this repeatedly to work and on the weekend. I like how the red lipstick, silver bag and turquoise shoes look together and pick up colors from the skirt. 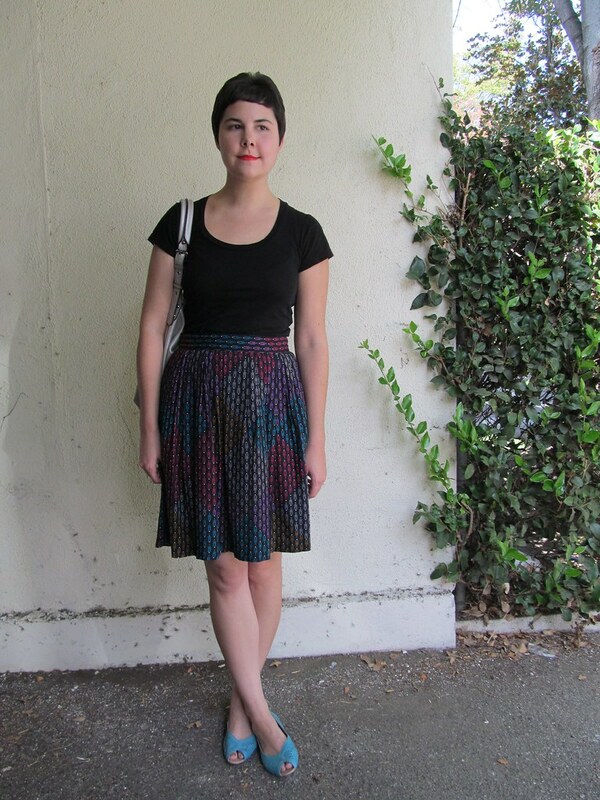 I love the way your blue shoes makes the blue in the print of your skirt really stand out. Such a cool print on that skirt too. I can understand why you wear it so much! i will love this skirt forever!!!! Love the simplicity of your skirt. Cheers!